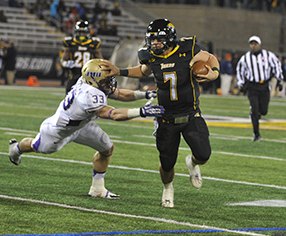 Towson quarterback Peter Athens and the Tigers held off James Madison for their 10th victory of the season Saturday. Terrance West ran for 100 yards and three touchdowns in the Tigers’ 28-17 home victory over the James Madison Dukes Saturday afternoon. With the win, the Tigers tallied their 10th victory of the season and secured a spot in the NCAA FCS Playoffs. Sunday morning, the Tigers gathered in PAWS in the University Union with students and supporters to watch the tournament selection show on ESPNU. Quickly, the Tigers learned that they were seeded seventh overall and will receive a first-round bye. On Dec. 7, Towson will host a second round game at Unitas Stadium against the winner of this Saturday’s contest between Fordham and Sacred Heart. Senior Jerrelle Benimon scored a game-high 21 points and pulled down 10 rebounds in the Tigers’ loss to national powerhouse Kansas Friday night at Allen Fieldhouse. Battling one of the top-ranked teams in the nation featuring Andrew Wiggins, the top-ranked freshman in the country, the Tigers struggled from the field in the first half and were unable to make up the deficit in an 88-58 defeat. The Tigers picked up the pace in the second half, rattling in five 3-point shots and out-scoring the Jayhawks 42-39 in the period. Rafriel Guthrie joined Benimon in double-digit scoring, with 15 points. In the second leg of a Saturday double-header, following the football team’s win against James Madison, the women’s basketball team fell to the No. 8 Maryland Terrapins in a home contest at SECU Arena, 90-53. Senior guard Tanisha McTiller poured in a season-high 25 points for the Tigers, but the larger Terps controlled the boards, out-rebounding the Tigers 46-21. The Tigers next face the UMBC Retrievers at SECU Arena on Nov. 26 at 5 p.m. The women’s swimming and diving team moved to 10-0 on the season, defeating McDaniel College Saturday afternoon at Burdick Pool. This is the seventh consecutive season that the Tigers have recorded a 10-meet winning streak under head coach Pat Mead. Freshman Noah Pritchard won two events, the 100- and 200-yard backstroke, to propel the men’s swimming and diving team to victory Saturday. The Tigers rolled, 196-70, to move to 8-1 on the season. Both teams have an extended break until their next competition after the new year. The Tigers will host George Mason on Jan. 11 at 1 p.m.